My high school was an average school with average students. At least, that’s how I’ve usually thought of it. Many of had successes and have gone to own businesses, work in various professions, even go to Hollywood (without success). In general though, few of us have made national news or achieved national prominence. But you know what? That’s not a good assumption. A classmate of ours was recently quoted in the newspaper, being asked to comment on a freedom of speech lawsuit going to court in Virginia. I looked him on Google and wow! What a list of accomplishments, including dean of a nationally recognized law school. He’s a big, big name in the legal field. And I got to thinking about this assumption and why it’s not good. My brother-in-law went to the same high school. He achieved tremendous success as a partner in a large consulting firm who name you’d recognize if you watched any PGA golf tournaments. I’m known nationally in my field. Locally, a number of graduates from our high school have recognized names in the community where we grew up (or nearby communities). Whether we achieved enough or not was not a good assumption. This is why it’s necessary to verify assumptions. It’s not that I thought of us as losers, but more as average joes. We’re not. Our high school turned out a lot of achievers, men and women who did great things with their lives. Yes, there were average joes and janes. But you know, many of us have had worthy accomplishments to be proud of. I don’t have my high school graduation picture scanned, but I do have my paternal grandmother’s high school graduation picture. Her accomplishment in life was her children and grandchildren. She’s dead now for over 15 years, but her influence is still in the life of my husband and myself. He grieved her death as much as I did. And isn’t that a worthy accomplishment? To be loved and missed. Word for tomorrow – CORNER. If you prefer to work ahead, see the list for the week under “A Word A Day”. I’m glad you liked it.� Thanks! Great post and sage advice!! That picture is amazing – was is taken in the 1920s? Thanks for stopping by – I really like your blog and the archival / historical posts. Yes, the picture was taken in the early 1920’s. 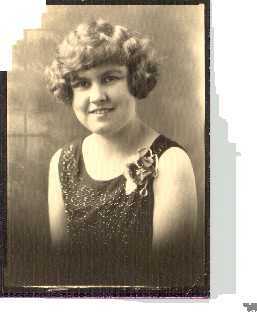 I also have my great aunt’s graduation picture (my grandmother’s older sister by one year). Her hair was very sleek and smooth, like a flapper would wear.